The following essay is adapted from “Foreclosed: Destruction of Black Wealth During the Obama Presidency,” a report out today from our friends at the People’s Policy Project. The Obama presidency was a disaster for middle-class wealth in the United States. Between 2007 and 2016, the average wealth of the bottom 99 percent dropped by $4,500. Over the same period, the average wealth of the top 1 percent rose by $4.9 million. This drop hit the housing wealth of African Americans particularly hard. 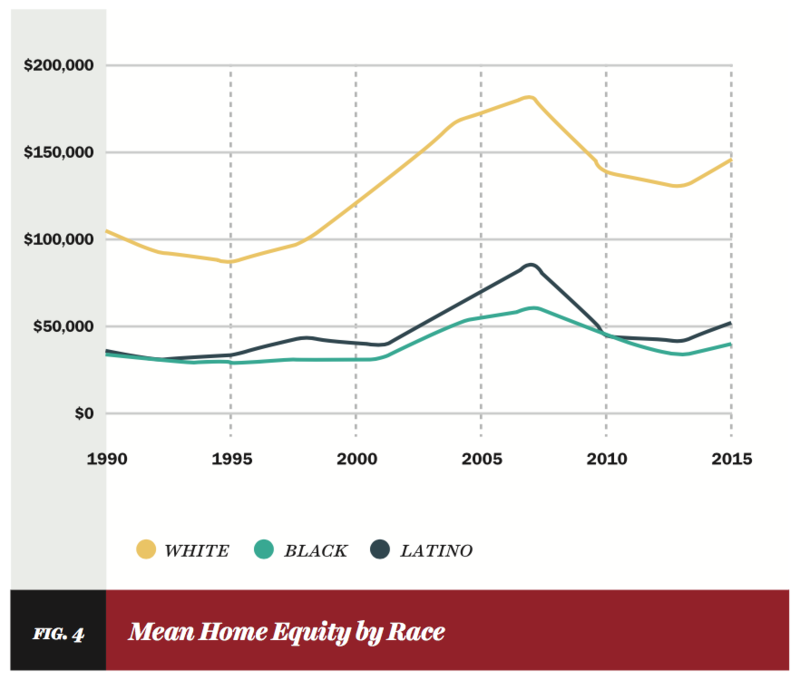 Outside of home equity, black wealth recovered its 2007 level by 2016. But average black home equity was still $16,700 lower. Much of this decline, we will argue, can be laid at the feet of President Obama. His housing policies led directly to millions of families losing their homes. What’s more, Obama had the power — money, legislative tools, and legal leverage — to sharply ameliorate the foreclosure crisis. He chose not to use it. Out of an initial promised 4 million mortgage modifications — itself a drastic underestimate — by the end of 2016 only 2.7 million had even been started. Out of that number, only 1.7 million made it to permanent modification, and of those, 558,000 eventually washed out of the program. An epic crime spree after the crisis offered another opportunity to assist beleaguered homeowners. During the bubble years, originators and banks had routinely mangled the paperwork while issuing loans and packaging them into securities. When they went to foreclose, they often found they did not have the correct documentation. But rather than acknowledging their indiscretions, financial institutions paid large teams of entry-level employees to commit document fraud on an industrial scale — forging signatures, falsely notarizing documents, or falsely attesting to “personal knowledge” of large mortgage files, hundreds of times per day. This was the so-called “robosigning” scandal. These document problems eventually came to the attention of law enforcement. Forty-nine state attorneys general, the District of Columbia, and the Department of Justice banded together in a lawsuit, which resulted in a $26 billion joint settlement between them and the five largest servicers. However, largely due to foot-dragging at the Department of Justice, the settlement ended up being toothless. Much of the cash went to “short sales” (simply selling an underwater home) instead of principal reductions, or to other weak relief. Servicers even received roughly $12 billion in credit for waiving outstanding debts from short sales in states where such a waiver is already legally mandatory. JPMorgan Chase allegedly claimed credit for forgiving loans that it had already sold. Unsurprisingly, bending over backwards for the banks failed to stop the wave of foreclosures sweeping the nation. All told, some 9.3 million homeowners lost their homes. It was the greatest destruction of middle-class wealth since the Great Depression at least. Even before the crash, decades of discriminatory policies had depressed African-Americans’ housing wealth. New Deal federal housing subsidies — the bedrock of the postwar middle class — largely locked out African Americans. Racist housing covenants forbade neighborhoods from selling or renting to black families, back up by the threat of riot. Black families that could buy were often brutally exploited by contract sellers. The mortgage bubble fostered similar abuses. Originators, looking for anyone to take subprime mortgages, handed them out to disproportionately black lower-class people, and steered black middle-class families who would have qualified for ordinary mortgages into subprime loans as well. Former Wells Fargo employees later testified that the bank deliberately tricked middle-class black families (who they called “mud people”) into subprime “ghetto loans.” Overall, a Center for Responsible Lending study found that from 2004 to 2008, 6.2 percent of white borrowers with a credit score of 660 and up got subprime mortgages, while 19.3 percent of such Latino borrowers and 21.4 percent of black borrowers did. The effects of the foreclosure disaster are starkly apparent in Survey of Consumer Finances data. To start, the homeownership national rate shows a marked decline over almost the whole Obama presidency, reaching the lowest rate since 1965 (before slightly rebounding). 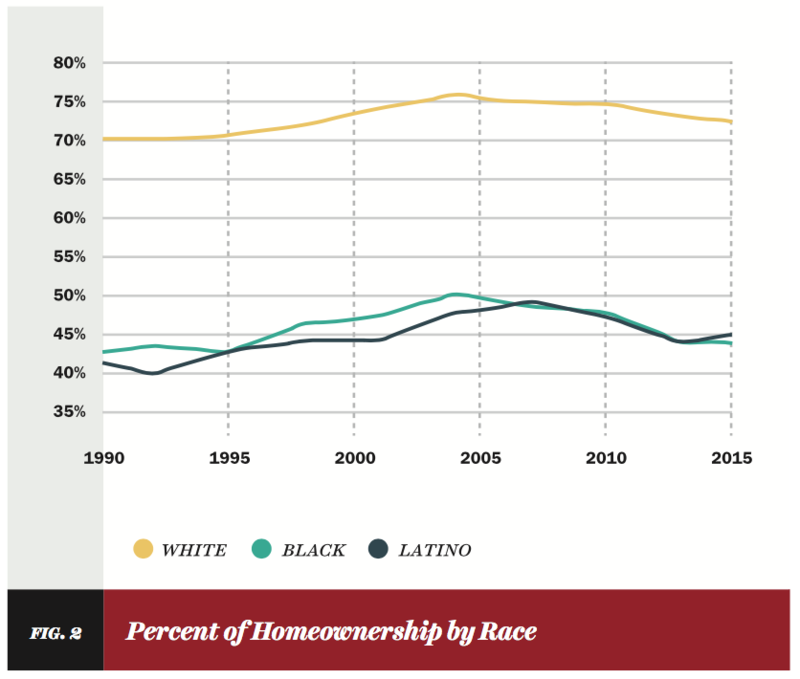 Broken down by race, the overall story for homeownership is similar for all groups, but black homeowners started lower and stayed lower than white ones, with no rebound at all from 2013 to 2016. 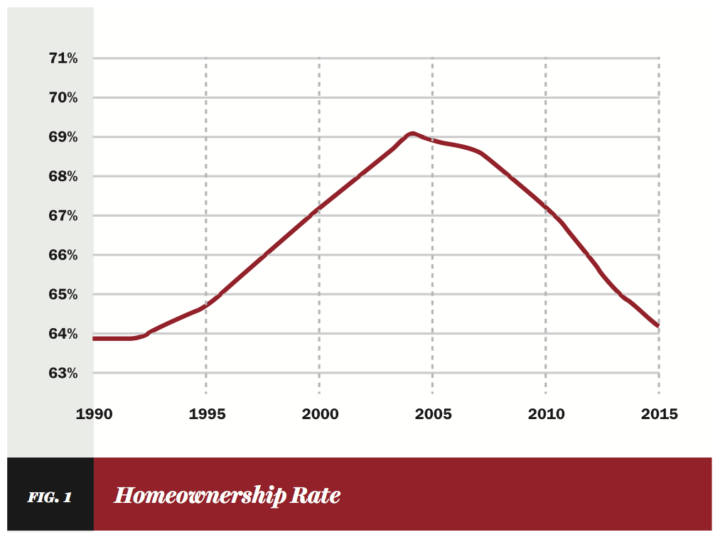 However, the total homeownership rate can be misleading in that it includes people with negative equity, which is worse than owning no home at all — it is merely “a rental with debt.” After the crisis, the percentage of black homeowners with negative equity exploded by twenty-fold, from 0.7 percent to 14.2 percent — and unlike white families, did not reach its peak until 2013. The sharp decline from 2007 to 2013 is readily seen, as well as partial recovery through 2016, and the large racial wealth gap. 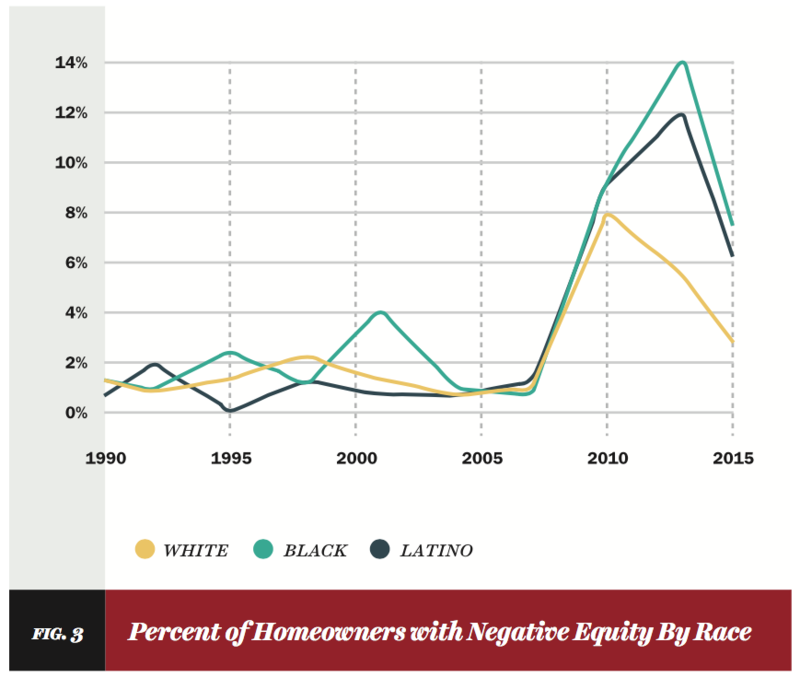 Average white home equity in 2016 is 3.5 times greater than the same black figure, and it has regained 84 percent of its 2007 value, compared to a black figure of 73 percent. Then there are the distributional effects. Home ownership makes up a much larger percentage of black and Latino wealth than it does white wealth, and a much larger percentage of middle-class wealth than top wealth in all racial groups. On the eve of the recession, middle-class families tended to hold 50 percent to 70 percent of their wealth in home equity, while the wealthiest 10 percent of families held 15 percent to 30 percent of their wealth in home equity. Given these differences in wealth portfolios, bailing out financial assets after 2008 while allowing homeowners to drown directly concentrated the national wealth into the hands of the richest white families. Between 2007 and 2016, the wealthiest 10 percent of white families saw their wealth expand by an average of $1.2 million (21.6 percent), the next wealthiest 10 percent of white families increased their net worth by an average of $141,000 (15.5 percent), and the top 10 percent of black families grew their wealth by $78,000 (8 percent). Everyone else experienced wealth declines as high as 40 percent. Mass foreclosures have severe ripple effects. People who lose their homes are at greater risk of job loss and falling into poverty, and are more likely to commit suicide. Nearby homes lose value, as foreclosed properties are often blighted. A 2013 Center for Responsible Lending study estimated that properties in proximity to a foreclosure shed $2.2 trillion in value — and that half that loss was in communities of color. 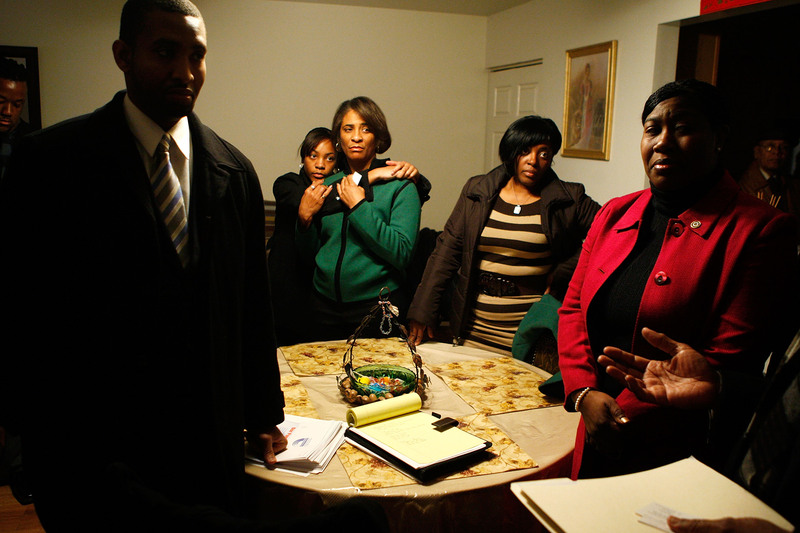 The decision to hang homeowners — especially black homeowners — out to dry was a catastrophe. The obvious place to start would have been a better HAMP. The administration should have followed the formula of the Home Owners’ Loan Corporation (HOLC) of the 1930s. The program bought up mortgages in default, and refinanced them with a lower interest rate and with a longer, fully amortized repayment period — a great help because there were no such mortgages at the time. Given that Fannie and Freddie had trillions in mortgage assets, that could have provided hundreds of thousands of modifications immediately — and the $75 billion could have bought a lot more. The goal would be to find and delete as much bad housing debt as possible, while keeping anyone who could pay anything even halfway reasonable in their homes — with generous terms when people fell behind. HOLC, for instance, usually waited an entire year before foreclosing on anyone who stopped paying, and tried to space them out to avoid broader economic damage. The second possible strategy involves the aforementioned tsunami of crime. Mortgage fraud is a serious crime in every state. And in New York, state law stipulates that underlying assets in an asset-backed security must be treated in accordance with the rules that set it up. These contained the usual legal boilerplate about how paperwork must be filed correctly. If a security did not follow the contract, it would be void. Under federal law, the income from such a broken security could be taxed at 100 percent. With the threat of prosecution and taxation, the administration could have forced banks and servicers to accept genuine relief for underwater homeowners. Then–Federal Deposit Insurance Corporation chief Sheila Bair had another good idea: simply force the banks and servicers to write down to face value any underwater mortgage that was more than sixty days delinquent. But the administration did not pursue that idea either. Instead, they let homeowners suffer as Wall Street returned to racking up enormous profits. It is impossible to say with any certainty what the precise effects of a sensible housing policy would have been. But it unquestionably would have prevented a huge fraction of the wealth destruction detailed above. The overall housing crash would have passed much sooner — even in 2016 the rate of foreclosure was higher than it was in 2005. No political obstacle stood between President Obama and a better housing policy. On the contrary, his heavily bank-slanted policy cost the Democrats dearly: mass foreclosure, and the associated economic wreckage, is a large part of why his party was crushed in the 2010 midterms. Because African Americans were disproportionately victimized at all levels of the housing and foreclosure crises, they stood to gain the most from better policy. But because Obama’s approach failed cataclysmically, the first black president in American history turned out to be a disaster for black wealth.